The inspired altruistic work of the Coca-Cola company continues! In case you're wondering what I'm talking about, I'm talking about a beverage company that is pretending to care about fitness to be part of the "solution" to obesity and they've just announced their latest round of "help". 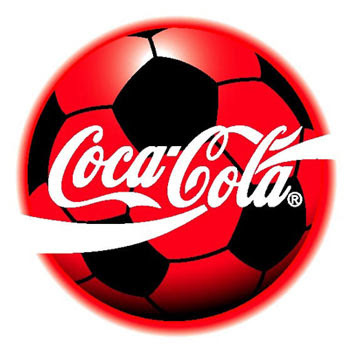 Distributing thousands of "Coca-Cola soccer balls" at major sporting events. Encouraging people to sign up for myCokeRewards to get a chance at winning a pedometer....and enjoy an immersive Coca-Cola centric marketing experience on their website and give Coca-Cola permission to market to them directly. A new campaign calling on Americans to vote for their favourite parks so Coca-Cola can give them a grant to build something. Coca-Cola "Happiness" trucks to roll through more neighbourhoods and towns to inspire people to "move to the beat"....and drink a Coca-Cola bottled beverage. "I think it’s probably a leading indicator of potential sales." "We want to double our business in basically a decade." Somehow I don't think a doubling of Coca-Cola's business is going to help obesity much, do you? Probably not soccer balls or permission marketing either. The Best Kiss Cam Video Ever?